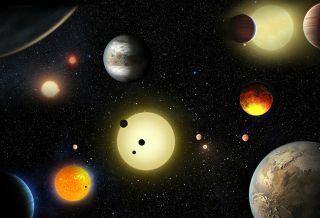 An artist's illustration of various exoplanets and suns. The hunt for alien worlds has been the source of many exciting discoveries, as the number of confirmed planets outside Earth's solar sytem has more than doubled this past year. In August, astronomers announced the discovery of a world called Proxima b, which orbits Proxima Centauri, the closest star to Earth's own sun. Proxima b has a minimum mass of about 1.3 times the Earth's, and it's located roughly 4.22 light-years away. What's more, it orbits within the habitable zone of Proxima Centauri, which means this planet could have a surface temperature that would allow for the presence of liquid water. This means that this rocky world has the potential to support life. A giant, icy world called Planet Nine is thought to exist in the Kuiper Belt at the outer edge of Earth's solar system, and astronomers could be on the cusp of actually finding the distant world. This undiscovered planet is believed to be about 10 times more massive than Earth and have an average temperature of minus 374.8 degrees Fahrenheit (minus 226 degrees Celsius). Astronomers announced the potential for the discovery of Planet Nine in January 2016, and in October, they predicted the planet would be found within 16 months or so. Astronomers are using mathematical modeling and computer simulations to pin down the location of this alien world. Observations of the orbits of six other, smaller objects in the Kuiper Belt suggest that a much more massive body (which would, theoretically, be Planet Nine) has a strong gravitational influence in this region. While Planet Nine is in our own solar system (if it exists), some astronomers speculate that it may be a former exoplanet that our sun's gravity captured at some point in the past. That's why it's on this list. In May, astronomers announced the discovery of 1,284 new exoplanets, the single largest haul of alien worlds made to date. Among the exoplanets discovered were nine rocky worlds that could possibly support life as we know it. This discovery was made using NASA's Kepler space telescope, which finds planets that dim their stars as they orbit past. The number of confirmed exoplanets now stands at a staggering grand total of 3,439. "This gave scientists hope that somewhere out there, around a star much like ours, we can eventually discover another Earth," NASA officials said in a statement. In fact, two of the exoplanets, Kepler-1638b and Kepler-1229b, are among the most Earth-like planets ever found, as they orbit within their host stars' habitable zones. A giant alien planet called 2MASS J2126 was found orbiting 600 billion miles (1 trillion kilometers) from its host star, making this planet's star system the largest one known. In fact, the exoplanet has such a wide orbit that astronomers previously thought it was a "rogue" planet flying freely through space. For comparison, 2MASS J2126 orbits 7,000 times farther from its star than Earth does from the sun. At that distance, the gas-giant exoplanet completes one orbit every 900,000 years or so. In May, astronomers found an alien solar system called TRAPPIST-1, which lies 40 light-years from Earth. The system features a tiny, ultracool dwarf star and three small potentially habitable exoplanets. As an ultracool dwarf star, TRAPPIST-1 is 2,000 times less bright and less than half as warm as the sun. What's more, this alien world is only about one-twelfth the sun's mass and less than one-eighth the sun's width, making it only slightly larger in diameter than Jupiter. This strange star was discovered using the TRAPPIST (TRAnsiting Planets and PlanetesImals Small Telescope) telescope in Chile. The three exoplanets found orbiting TRAPPIST-1 are each only about 10 percent larger in diameter than Earth. The discovery of this alien solar system marked the first time that an exoplanet had been found orbiting an ultracool dwarf star, astronomers said. Also this year, astronomers detected exotic weather on a large exoplanet known as HAT-P-7b. The upper atmosphere of this alien world boasts powerful winds and clouds composed at least partially of corundum, the mineral that forms sapphires and rubies. This was the first discovery of weather on a gas giant planet outside the solar system. HAT-P-7b is about 40 percent larger than Jupiter and is located 1,040 light-years from Earth. The planet orbits its host star every 2.2 days, and it is tidally locked, with the same side always facing its parent star — just like the moon always presents the same face to Earth. Using NASA's Hubble Space Telescope, astronomers characterized the atmosphere of a "super-Earth" exoplanet for the first time, revealing hydrogen and helium, but no water vapor, in the air of an alien world called 55 Cancri e.
Located 40 light-years from Earth's solar system, 55 Cancri e is an exoplanet that is about two times wider and eight times more massive than Earth. What's more, this alien world lies incredibly close to its host star, completing one orbit every 18 hours, indicating that the planet is far too hot to host life as we know it. In fact, scientists estimate that surface temperatures on 55 Cancri e can reach up to 3,630 degrees F (2,000 degrees C). Another exoplanet discovered this year was also spotted orbiting multiple stars. The strange new world, HD 131399Ab, circles three stars at once in a highly exotic celestial arrangement. HD 131399Ab is located 340 light-years from Earth, in the constellation Centaurus. For about half of the planet's orbit through the system, which lasts 550 Earth-years, all three stars are visible in the sky. The system exhibits a strange configuration: Exoplanet HD 131399Ab orbits a large, bright star — call it Star A — and then the exoplanet and Star A are orbited by a pair of stars referred to as Star B and Star C. This multistar system was the first found with such an exotic configuration. NASA's Kepler space telescope suffered two gyroscope failures in 2013 that rendered it unable to hold its former focus on one precise patch of the sky. But that didn't stop Kepler: Scientists developed a new mission for the scope, aptly named K2. Using its two remaining gyroscopes, its thrusters and the pressure of sunlight, the telescope now observes different portions of the sky, each for up to 83 days, and then rotates to prevent sunlight from coming into its field of view. K2 has unveiled 458 candidate planets, 173 of which have already been confirmed. This includes two rocky exoplanets called K2-72c and 72e, which orbit within the habitable zone of their host star (located about 181 light-years from Earth). K2-72c circles slightly closer to the host star with a 15-day orbit, while sibling K2-72e has a 24-day orbit. Additionally, K2-72c is about 10 percent warmer than Earth, while K2-72e is about 6 percent colder than Earth. Yet another planet with multiple stars was discovered in 2016. A newfound alien planet called KELT-4Ab has three suns in its sky. Similar to exoplanet HD 131399Ab and its star trio, KELT-4Ab has a strange celestial configuration. KELT-4Ab orbits the star KELT-A once every three days. In turn, a nearby pair of stars then orbits KELT-A. What's more, the twin stars, KELT-B and KELT-C, orbit one another once every 30 years, and together they travel around KELT-A and its planet every 4,000 years or so. Astronomers estimate that, to viewers on the planet, KELT-A would appear to be about 40 times as large as the sun appears in the sky on Earth, while the pair of stars would appear about as bright as the full moon in the sky. This strange system is only one of the few known to contain three stars.